Choosing a yoga retreat can be daunting, and this post aims to demystify that task, making your choice of yoga retreat less risky, and surer. Here are ten important considerations when choosing a yoga retreat. The first thing to think about when choosing a retreat concerns the location: Where do you want to go? Do you want to be by the sea, near mountains, in hot, dry weather, cool weather, humid weather, on an island, in a spiritual place, etc. Ask yourself this question: What surrounding area would help me deepen my yoga practice? For your retreat to work its magic you ideally want the conditions around you to be as conducive to your practice as possible for you go deep within yourself. For this, your surrounding location needs to be the rich soil that allows you to blossom naturally. « The Mirage is the perfect getaway in the midst of nature and all things natural. A great place to conduct wellness and healing retreats. It’s cosy enough to make the experience intimate. The yoga studio with trees all around is just gorgeous and very zen. » Ayesha and Hugo from Yog Amore lead their first yoga retreats to The Mirage in May and October 2018. « For yoga and meditation practice there is a super glass yoga shala amidst a bamboo grove and I am looking forward to the luxury of a swimming pool and spa which are presently being constructed, which will surely enhance the serene experience of being on retreat at The Mirage. » Suzanne Jevon-Hughston, owner of Jevon Yoga and Jevon Yoga holidays brought her first yoga group to The Mirage in 2017. Personally we think The Mirage is perfect for nature lovers seeking a secluded and place with traditional adobe dwellings and silent mornings with birdsong, meditation and chanting, and stunning views across the Himalayan peaks. To get the full flavor and magic of The Mirage Yoga Retreat, listen to Ayesha describe the location in her short video. We think you’ll agree that ’No-one forgets a good teacher’. Remember that wonderful school teacher, who was so inspiring that they totally changed your affection and interest for a subject. The same is true for yoga, and great yoga retreats are run by great yoga teachers, because organising an outstanding, life-changing yoga retreat requires dedication, passion and a determination that all the conditions will make everyone’s yoga experience deep and memorable. That’s the power a teacher has. A great teacher can inspire you to heights beyond which you didn’t think possible. So, if you don’t already know your teacher, check their credentials and make sure you travel with an outstanding yoga teacher. Check out reviews if they have any. If you’ve taken classes with them already, do you want to go deeper with them into yoga? In the end, it’s best to make a decision on reputation and how you feel about your teacher, should you know them already. If you’re a teacher and you're considering leading a group, please grab a copy of our Teacher’s Pack, to help you think about the logistics of your yoga retreat. What do you want from your retreat? Do you want pure yoga and noting else or would you prefer a combo, like yoga and pottery, or yoga and walking, both possible options at The Mirage. It’s a good idea to ask yourself this question. What so I want to get from this retreat ? 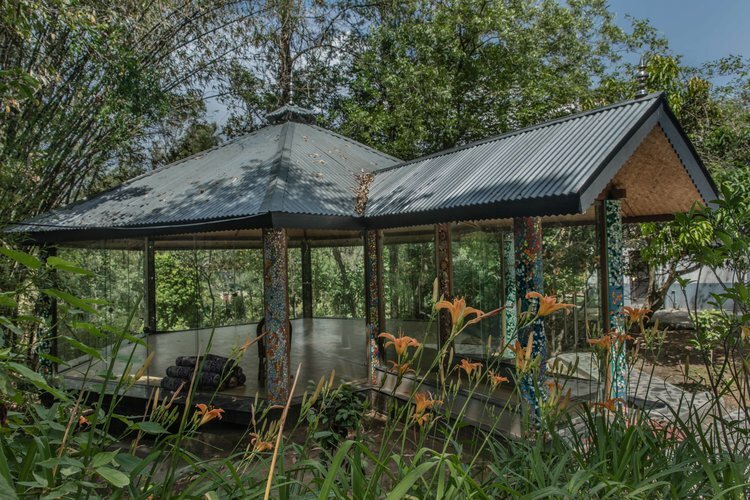 If you want to just chill out on the mat and destress by the pool, you definitely don’t want to choose a retreat that includes hiking in the mountains. You might want to go deeper into your practice, or combine it with music and culture, which we can also offer at The Mirage, or just unplug from the madness, recharge your batteries, be inspired to start a daily routine, or learn more about a specific yoga style. Whatever it is you want, make sure the retreat will help you achieve your retreat goals. When we truly want something, we generally find a way to make it happen. If you’re working so hard, you deserve a retreat that will truly bring you back to center and help you hit the reset or refresh buttons. That being said, it’s important to double-check whether the retreat price includes lodging and food. Most do, but you never want to assume. At The Mirage we’re transparent about our pricing for yoga teachers, and our price includes benefits and discounts for group leaders. Once a again, all the pricing information about what is included and teacher discounts are in our Teacher’s Pack. One thing that affects price is season; Some retreats, like ours, are cheaper in the low season, when fewer tourists are in the area, and when the weather is predictable. Another tip is some retreats offer options, which can give a nice price saving. If you’re the outdoorsy type, camping might be a nice option for you. Do you just want to get away for a booster weekend retreat, or do you want need a week or longer to really go deep into your practice? If you're travelling from far away, consider the time to get over jet lag and make your stay longer for maximum effect. There’s no doubt that you can reach places within yourself on longer retreats that include several silent days, but you might simply be needing a weekend to touch base. At The Mirage, we can accommodate different options and lengths of stay. Just ask and remember, we’re here to serve you. Are you the high-flying kind with impeccable taste and a disdain for anything that crawls in the night? Do you need a room to yourself? Or would you prefer the company of another person to make the journey with? Will you survive without Wifi or is an opportunity to unplug from your mobile and the Internet exactly what you need? Do you want a pool nearby, with massage therapists on hand at the retreat? Or do you just want to yoga and nothing else? Are you happy with dry toilets or do you want the comfort of a modern bathroom and shower. Do you want air conditioning or is a fan and a mosquito net sufficient. We all have different exigencies when it comes to our creature comforts so we recommend you make a list of your basic level of creatures comforts and that you cross check these carefully with the comfort levels at the retreat. At The Mirage, we’ve put a lot of effort into our furnishings and amenities like providing modern bathrooms, verandas, bed linen, pillows and mattresses. Having said that, we cannot keep every creepy crawly out of the buildings, because this is rural India and nature is part and parcel of the authenticity we like to provide, rather than a modern chain hotel feel. One final comfort level we like to provide is pure potable drinking water throughout our retreat from every tap on the residence. That’s because we have our own well, so there are no risks of contamination by water, which remains a problem in many parts of India, so pay attention to sanitation and water, wherever you go. Make sure it’s the right style for you. If you want a stronger, more powerful style of yoga then you might want something like Ashtanga or Bikram yoga. If you desire a more gentle, fluid type of yoga then Yin yoga or vinyasa flow might suit you better. Our teachers vary in the types of yoga they offer. Do you want an early morning yoga class, perhaps with sunrise, then a free period or two or three yoga classes a day, with a detox and spa in between? Ask yourself how important is it to have silence and meditation included. Do you want to learn more through satsan and lectures? Are chanting and kirtan important for you? So, our advice is to evaluate the actual program of the retreat to see if it matches what you’d like your schedule to be. One of the best things about great yoga retreats is the delicious healthy vegetarian food. Here at The Mirage, our Indian chef and kitchen staff prepare all the meals from fresh ingredients, many from our veg garden, and our policy is to satisfy the food preferences and to cater for the food intolerances of our guests. Whether you’re vegetarian, vegan, or gluten-free, just let us know your preferences and we’ll cater for you just as though you were at home. We know from experience that a detox can be a great way to start new eating habits, and lose some superfluous weight in the process. Having a week of exercise, nurturing, and healthy eating does wonders for the natural health of body and its digestive system. Going on a yoga retreat is an opportunity to step into a healthier interaction with food. If you want a lot of personal attention from your teacher, it’s preferable to opt for a smaller group of people. We think 12 persons is a sweet spot that offers sufficient variety of people, without being too overwhelming. If you want to meet a lot of new people and make friends, and aren’t bothered by a large group, you could opt for an ashram. Our retreat is small and intimate with lots of personal care.